This East Coast-collegiate style is well-loved, but is it up your alley? From clean lines and collared shirts to bold stripes and playful plaids, we break down the characteristics that define preppy style to help you identify if these plus size outfits are right for you. As women size 14 and up, we’ve generally had to use just one phrase to describe our style: plus size. Though there’s always work to do to make fashion more inclusive, options are now more widely available than ever before, giving us the opportunity to define our style more precisely. We’re here to help you break down different style categories so you can better describe your preferences and nail down exactly what it is that you love. Are you someone who loves stripes, collars, and playful pops of bold colors? Then you might just define yourself as someone with preppy style! The word “preppy” originates from the classic style that prep schools on the East Coast are known for. While these schools traditionally have had strict dress codes and uniforms, over the years, students have made their own individual style out of the pieces they were told to wear. Today, preppy style has infiltrated the fashion sphere on a huge scale. Preppy style is most similar to classic style, but with more pops of color and bold prints. While boho style leans towards earth tones and billowy silhouettes, preppy style features bolder and cleaner colors and structured silhouettes. Here is an example of a Dia Style Box handpicked for a customer with preppy style. To help you decide if preppy is a good descriptor of your style, here are some good rules of thumb. As always, remember that fashion rules are meant to be broken, so take them with a grain of salt! You appreciate clean-cut styles much more than worn or distressed styles. You have an affinity for nautical-inspired fashion. You love to watch TV shows about prep school teenagers if only for the outfit inspiration. You prefer bright, saturated colors or pretty pastels to natural earth tones or muted hues. New England style has a special place in your heart. Stripes and plaids are ever-present in your closet. Instead of flowy silhouettes, you prefer tailored and structured pieces. You like to look effortless and laid-back with distressed denim and easy tees. You prefer a moto jacket to a collared blazer. You have never owned a pair of khakis, polos, or boat shoes. You prefer studs to pearls. California’s laid-back style is more appealing to you than New England’s structured style. You find basics boring, and you always prefer shopping for statement pieces. More of a visual learner? 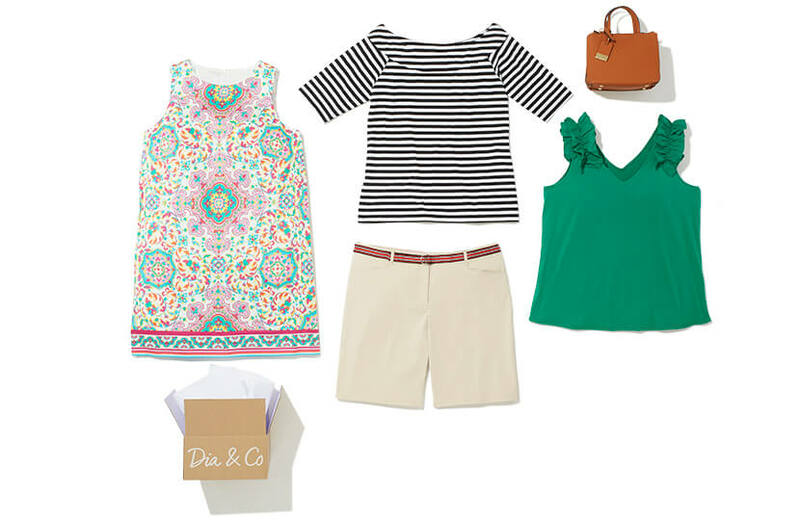 Here are some more plus size preppy outfits so you can get a feel for this style profile. A striped tee tucked into a denim skirt makes for a perfect spring and summer look. Punch up the prep with a hot pink clutch and subtle jewelry. Navy and white stripes give a nautical feel. Go for some print-mixing with a printed pair of heels and a chic handbag. 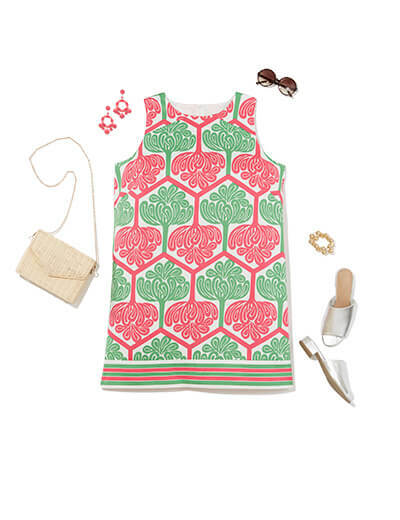 Pink and green are a classic preppy color combo. 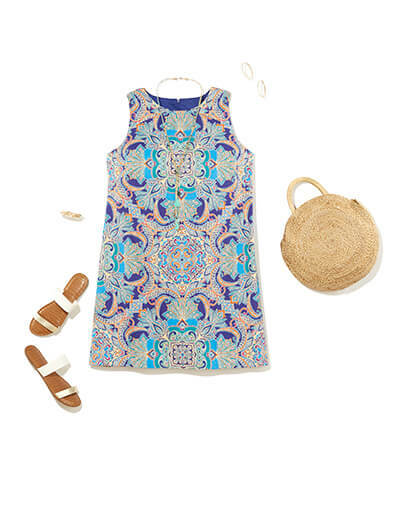 Let your printed dress stand out with understated accessories and slides. 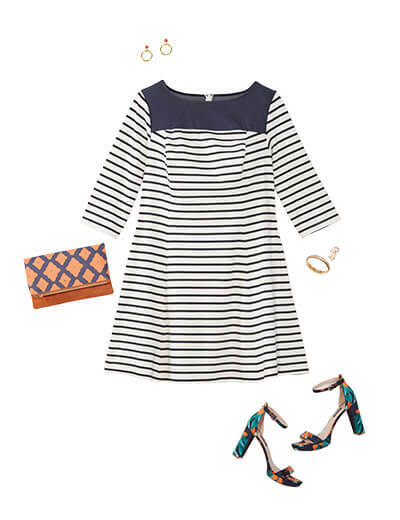 This classic silhouette is perfectly preppy and gets a beach update with a straw bag and sandals. Hamptons, anyone? 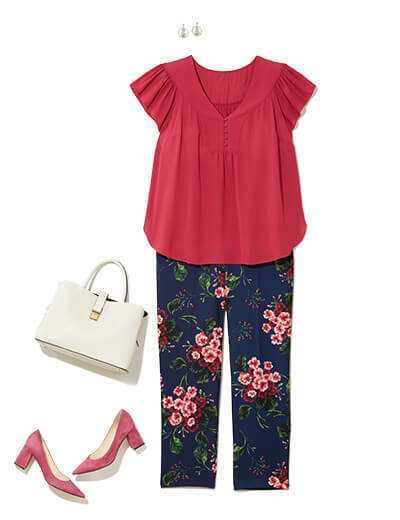 Printed pants are office-appropriate when paired with kitten heels, a work bag, and a solid blouse. 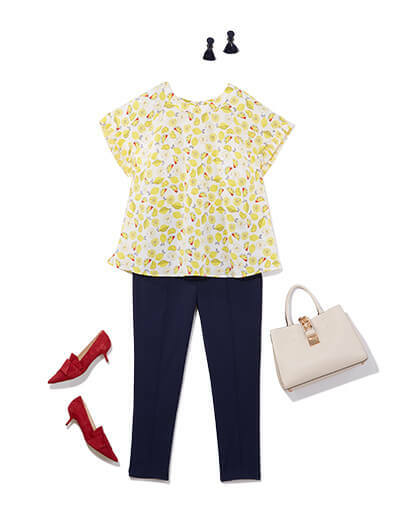 Navy trousers are a staple in any preppy wardrobe, but they get a spring update with a lemon-printed shirt. 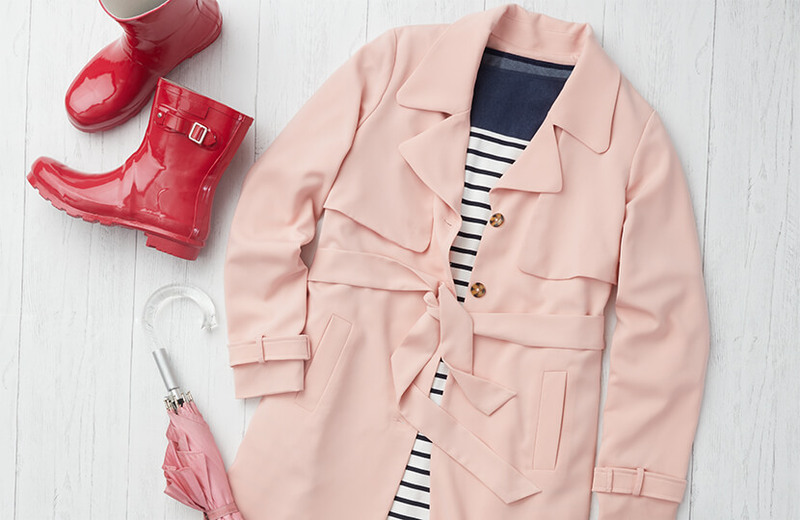 Not every rainy day is a grey day—if you have the right gear! 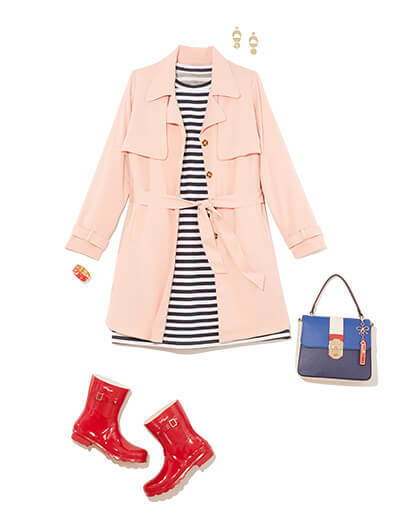 A trench coat in a soft pink is the perfect preppy complement to a navy-striped dress. Like stripes, gingham is an innately preppy print. A trench in a gingham print is a great way to bring a preppy punch to jeans and a sweatshirt. Do these outfits belong in your wardrobe? If so, make sure you update your style preferences and let your Dia Stylist know that you’re looking to fill your wardrobe with plus size preppy styles. so that your next Dia Style Box is the best one yet. Not the right styles for you? That’s okay, it’s often just as important to know what you don’t like as it is to know what you do like. Check out the rest of the posts in our “What’s My Style?” blog series to see if these other styles speak to you more—classic style, casual style, boho style.